Britney Malone, a 13-year-old black girl, was shot and killed on Friday, Sept. 28, in the 600 block of West Palmer Street in Compton, according to Los Angeles County coroner’s records. The shooting inside Britney’s family home around 6 p.m. also killed her stepfather, Edward Charles Talley II, 65, and seriously injured her mother, Katherine Evans, according to family members. Talley’s 43-year-old son, Jamie Jajuan Williams, was arrested in connection with the shootings, according to Los Angeles County Sheriff’s Lt. Joe Mendoza. Williams also lived in the home along with Britney's older sister and brother, according to her cousin Shayla Greene. Williams was charged with two counts of murder with a special circumstances allegation of multiple murders, and one count of attempted murder on Oct. 2, according to a news release from the Los Angeles County district attorney's office. Britney would have turned 14 on Friday, Oct. 5, and her family has organized a special vigil in her memory that day at 6 p.m., outside the family’s Compton home, said Greene. She was a first-year student at Compton High School’s Freshman Academy and popular in the neighborhood, Greene said, so candles and other mementos have already started accumulating outside the home in her honor. Investigators are still trying to piece together what happened inside the house on Sept. 28. Britney’s older brother had been at work when he got a call from his stepfather, Mendoza said. He called 911 to request a rescue at the house, and then called again, after he arrived, to report the shootings. “He’s been obviously distraught,” Mendoza said. The arriving deputies found Williams standing naked in front of the house, where he was questioned and arrested, Mendoza said. It’s not clear why Williams was naked. He had some blood on him, Mendoza said, so investigators took him to the hospital “just to make sure he was OK” before they took him to jail, where he is being held without bail. Investigators found a handgun inside the house that they believe was the murder weapon, Mendoza said. 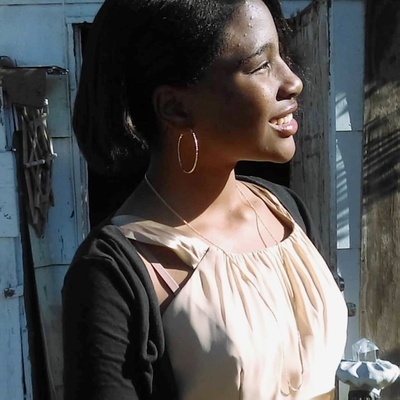 Britney was a conscientious student, Greene said, and was doing so well that she had been invited to join the Upward Bound program that allows high school students to take college-level classes. Britney also wanted to join the cheerleading squad at the school, but her parents didn’t have the $300 she needed to register and get a uniform, Greene said. Greene has started an online fundraising account to help her aunt with burial and other expenses. Britney’s oldest sister, Champagne, an Army reservist based at Ft. Gordon in Augusta, Ga., is also trying to to acquire a Compton High School cheerleading uniform for Britney to hold when she is buried. “She wants to try to get that for her now, since she couldn’t get it for her when she was alive,” Greene said. Williams pleaded not guilty during his arraignment on Oct. 2, according to prosecutors. His next court appearance its scheduled for Oct. 24 in Department D of the Los Angeles County Superior Court’s Compton Branch. Photo: Britney Malone, 13, poses in a family photo before attending her first school dance this spring, just a few months before she was fatally shot in her home on Sept. 28. "I feel so beautiful," she told her cousin, Shayla Greene, after she sent the photo. — Shayla Oct. 17, 2018 at 9:56 a.m.
— Kenya Gomez Oct. 5, 2018 at 8:37 a.m.
She was my really good friend from howard tanner elimentry and i miss her so much even tho I havnt talked to her in a while she will still be in my prayers and may god bless her family and friends. — Maleah Nava Oct. 4, 2018 at 1:48 p.m.